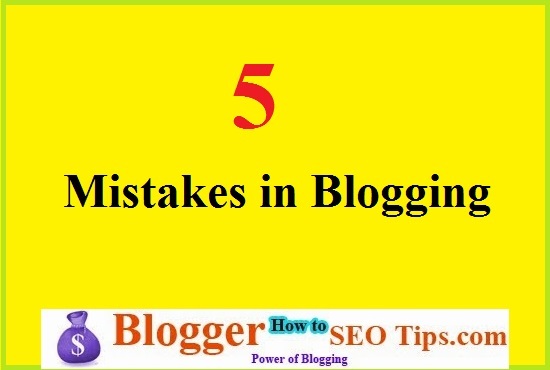 I have started blogging since last five years, I did many mistakes when I have started blogging, today I am going to share with you those mistakes, that's why you will not repeat. This post can change future of your blog ultimately yours, so read the article very carefully each and every mistakes I am going to share with you with proper solution. 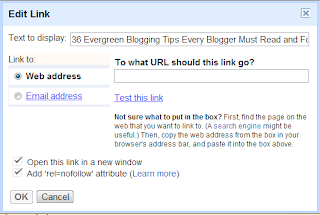 This is one of the biggest mistake in blogging, because it will kill your blog ranking, let me give you an example, if a visitor will come to your blog and the visitor will click on the link(for any reason) then the user will get redirect to that website, what will happen your blog will close. That means visitors will stay on your blog for few time and how much time your visitors are staying on your blog is one of the great thing in blogging because if your visitors will stay on your blog more time then your blog ranking will increase and also your revenue will increase. 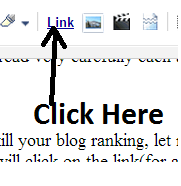 One more thing I would like to discuss with you, there are two types of links dofollow and nofollow, if you are providing link to other websites then do provide nofollow links and for internal blog linking provide dofollow links. 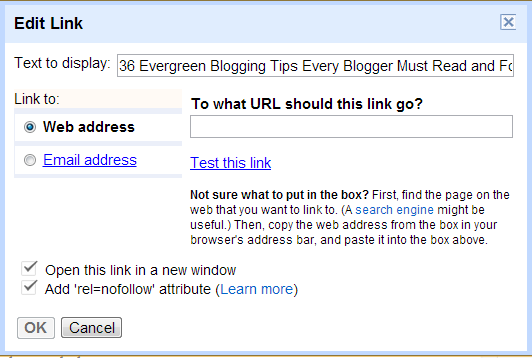 Now a window will open, as I have given below screen shot, do as same as if you are providing link to other websites for better ranking of your blog. 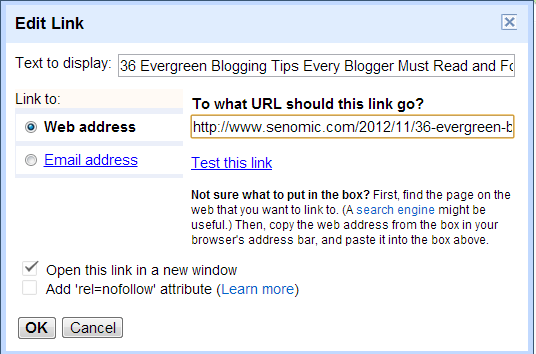 Provide your desire url on the box just after "To what URL should this link go". 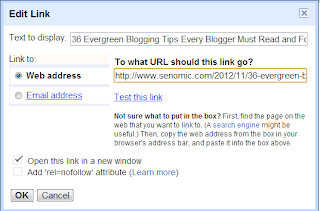 But do not do this steps if you are providing links to your own blog post, like internal link I have provided to my blog. At the last don't forget to click on OK, here one more point I would like to share with you, if you are providing link to any another page (Other website or blog) then don't forget to tick on the "Add 'rel=nofollow' attribute", this option you can see on the above screen shot too, which is a attribute used to tell search engine that search engine will not pass page rank to that link. In blogging almost title is every thing, if you wanna get massive traffic to your blog, of course as a blogger you want to drive traffic to your blog, because traffic equals money. So here is the tips for you to think like a smart blogger and drive traffic, always think before writing a title that if you are the user then what would you search for getting the information you are providing in your article. Read twice before going to make decision that this would be the title of the blog post, practice for next few blog posts it will be habituate for you then you don't need think lot of time to decide title of the blog post. Do you know there are millions of people do image search then if you are not providing images to your blog post then you are missing some thing cream in blogging. Here is the tips for you, how would you provide image to your blog post for attracting readers as well as getting traffic, always give name of the image as your title name of the post and see the traffic coming to your blog. This is my personal experience because images play very important role for imagination and one more thing images are better than article even, some times. For an example you can take Pinterest, the new age social network is attracting people only because of images are there. Now you need to paste it to your image on paint then you can drop the logo any where on the image you want to, you can see my most images having my blog logo on the footer. See, if you wanna get more traffic to your blog then you have to concentrate on your topic and provide keywords on your blog post related to topic which can change the future of your blog. This is really happening, use this tactics and see the visitors increasing for your blog, I am 100% sure you will get help from this. I have written a complete guide on Keyword Search- Google Keywords Planner Guide, I will suggest you to read the complete article with an info-graphic then implement on your blog just for few days and you will see the amazing traffic increase on your blog, again you need to implement another tips and tricks, which has been used by pro bloggers and beginners just missed this and they put all eggs in the box, means they totally depend on Google, okay this is good that you are getting organic traffic, means traffic from search engines but you need to use E-mail marketing to keep those visitors for forever. In blogging "Content is King", SEO is good to get traffic, but if your traffic will not happy from your article then you are not going to achieve your target, so always try to write best thing you know and if you don't know then search on the search engines, learn then write, otherwise do not write any thing which will make unhappy to your users. And why you must write more because short article means your visitors will stay short time on your blog, which will decrease your blog rank, always write more and informational article that's why your blog rank will improve day by day. Your blog post must have a good image, SEO optimized and of course headings, sub-headings and of course bullets, numbers too. Write case studies and advertise that on your social profiles, on your blog as showcase that's why people will come to know about it. And one day one of my reader asked me about all those checks in a conversation; so that is the power of case study, it will improve authority, branding and what not? No matter what will happen don't forget to provide quality content in a article, because we all said Content is King, I know it is really difficult to deliver quality content in each and every blog post, but not impossible. You need to share in your blog, what you have experienced not just copy writing others experiments, I am not saying do not write others success stories but don't just directly try to make it interesting and make it more useful for your readers. Over time, I have learnt lot of about blogging, with time to time I will try to provide here my best sources of making money online. Wow that’s the great article. Before I am don’t know about anything. Because it is helpful me keep it up my ranking. This is a great post especially the "content is king" bit. I think often bloggers tend to post "just enough" to make an article...they forget the internet is ultimately about content. EXCELLENT CONTENT UJJWAL,I REALLY GOT SOME VITAL INFORMATION FOR MY BLOG AND I WILL DEFINITELY WORK ON IT. Hello, @Kiran yes, mistakes always kill blog, so don't repeat these mistakes. Great job ujjwal, awesome blog lot of things to learn and share. ***** full five star to you. And thanks for reffering traffic to my blog, see at blogger buzz. I think we are already friends at G+ and twitter. Glad you for your five star rating, if you need any help let me know.